A steel project is a series of activities which takes place over a pre-arranged period of time to achieve a specified aim of commissioning of the project. The activities of steel project are usually one time activities which are not to be repeated in near future. Steel project activities differ from plant operation which consists mostly of routine activities. For achieving the specified aim, it is essential that project activities are properly and systematically planned. Project planning is done to increase the likelihood that the project will be implemented efficiently, effectively and successfully. Also, it is very much necessary that required time, resources, and efforts are provided as well used for the preparation of the project plan since a defective plan can lead the project to a situation which becomes out of control of the project team. A project plan is a formal, approved document of the project which guides the project execution and is required for the management and control of the project. It forms the basis for all the actions which are required to be taken by the project team for the implementation of the project. The planning document is not of permanent nature since it is necessary to continuously update it as the work of the project progresses. Project planning is important since (i) it guides the project team in its activities, (ii) it helps the project team to remain on track while progressing on work, (iii) It helps in focused monitoring of the work progress, (iv) it helps in the effective use of the resources, and (v) it creates confidence in everyone connected with the project that the project team by following the plans is on right course towards achievement of the results. 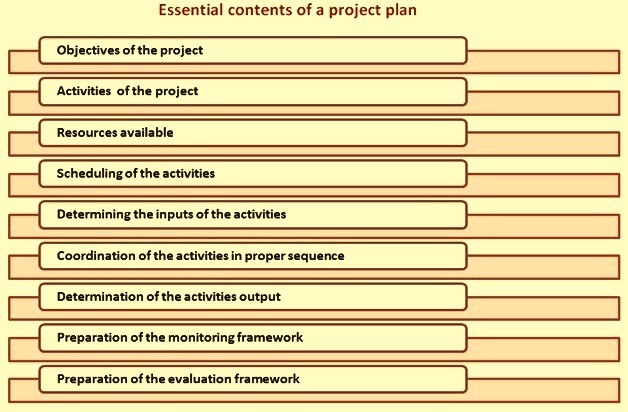 The essential contents of a project plan (Fig 1) include (i) objectives of the project, (ii) activities of the project, (iii) resources available, (iv) scheduling of the activities, (v) determining the inputs of the activities, (vi) coordination of the activities in proper sequence, (vii) determination of the activities outputs, (viii) preparation of the monitoring framework, and (ix) preparation of the evaluation framework by identifying performance indicators. Further, the project plan is required to be comprehensive, unique, unambiguous, and authoritative. It is to be continuously updated so that it always remains current. A steel project is always under triple constraints consisting of time, resources and quality. These triple constraints need to be controlled closely during the execution of the project. Hence, the key to a success in a steel project lies in its planning. Hence, project plans are important documents for the successful completion of the project. Effective project management requires project team to understand that it is necessary for the team to take a close look at all those activities of the project which are to be carried out by them. Also it is necessary that the project team is aware of the results which are expected from the activities which the team is to perform. For this, it is necessary that the project team carries out its activities in a planned manner since planning of the activities helps the project team not only in systematic working but it also helps the team to move forward at the expected rate towards the achievement of the project objectives. Project planning is an essential part of a steel project. In fact, it is at the heart of the project life cycle. The proper planning in a steel project helps to guide the project team through the implementation and closure of the project. It helps the project team to manage not only the triple constraints of time, resources, and quality, but also the changes which crop up during the project execution, risks, and other related issues. Often project planning is ignored in favour of getting on with the work. However, in such a case project team not only fails to realize the value of a project plan for saving time, costs, and many problems but also moves forward towards failures. Planning for the steel project is not to start and end in an office or committee room meeting. Also it is not to be done alone or in isolation from those who have to implement the project. It is necessary to involve during the project planning all those who are to use the plan during the project execution. Project plans becomes more accurate when the solutions suggested by the project team for various problems likely to encounter during the project execution are incorporated in the project plans. There are normally four distinct phases in a steel project. These are as follows. Conceptual and approval phase of the project – During this phase project concepts are being finalized through feasibility studies, approvals needed for the project execution are taken and funding arrangements are made for the project execution. Engineering phase – The main activity during this phase is project engineering. It starts with basic engineering and as the project work proceeds forward, detail engineering takes over. Other activities normally associated with the project execution are very limited during this phase. Project execution phase – During this phase along with engineering all the other activities has increasing role to play based upon progress of the work. In fact, as the project work proceeds, engineering activities start tapering down and other activities take over as the main activity. Each activity has its peak during the project execution and after its peak the activity starts tapering down. Closure phase – This phase is an important phase but with lesser amount of activities. During this phase defects noticed during commissioning activities are rectified, assistance is given to the work force to pick up experience in operation, guarantee tests are carried out, plant and equipments are handed over to the operation team, contracts are closed, and final payments released. During this phase, the project team gets lesser attention from the management, since attention of the management gets diverted towards the activities of the organization needed for the plant operation. The planning requirements in these phases are different in nature and hence different project plans are required to be made for each phase. Each phase needs different tools and techniques while the making and implementation of the project plans. Project planning is done for the purpose of (i) project integration management, (ii) project scope management, (iii) project time management, (iv) project cost management, (v) communication management during project implementation, and (v) project quality management. Careful and detailed planning helps in the reduction of risks and uncertainties during the project execution since in making of the plans many of these risks and uncertainties are foreseen and provisions are made in the plans for such potential risks and uncertainties. Project planning is that part of the management in a steel project, where required documents in the form of plans are made for the successful completion of the steel project. These planning documents include all actions required to define, prepare, integrate and coordinate all the activities of the steel project. The project plan documents are required to be detailed so as to clearly define how the project is to be executed, monitored, controlled and closed. The project planning is to be flexible to incorporate additional plans or remove certain part of the plan if needed during the execution of the project. The planning in a steel project is a very challenging activity since plans are normally made at a time when things are not fully frozen. Hence, it is necessary to update the project plans as the project makes progress by continuous measuring of the progress of the project against the project plan. Project planning is an essential activity in a steel project. It provides information to the management how to complete the project within a certain timeframe, usually with defined stages, and with designated resources. It requires an in-depth analysis and structuring of the various activities which include (i) determination of project objectives which includes commissioning and the project costs, (ii) setting of stages during project execution and time frames for completion of these stages, (iii) determination of the methodology for the project execution, (iv) identification of the project activities and their outputs, (v) creation of the schedules for the project, (vi) identification of resources needed for the project, (vii) determination of the project activities which need close monitoring, and (viii) identification of the supporting activities and planning for the same. Example of the support activities include planning of human resource needed for project execution, and planning for funds needed for the project etc. Two additional things which are required to be included in the project planning are the work quality and risk planning. Project planning in a steel project is normally done at two levels. The first level consists of overall plan and it is meant for the project management. The first level plan is concise and abridged plan which helps the project management both in taking decisions as well as the monitoring of the progress of the work. The second level consists of detail plans and is done at the department level. Detailed department level plans get coordinated at the higher level plan. This plan is meant for the persons working at the project ground level. The second level detail plan not only helps the project team in monitoring of the project activities but it also helps the team in planning of their day to day actions as well as their work priorities since these second level plans break down the project works into work breakdown structure (WBS), tasks list, Gantt charts, resource assignment and the risks involved and various other things. The planning process in a steel project consists of the following basic tasks. To identify from the project documents the activities for which plans are required to be made. To identify the project processes for which there are need for procedures to be made for taking action. The procedures are to be uniform as well as transparent. To define and sequence all the activities to be performed along with the outputs. To find out the inter-dependency between various activities. To estimate all the resources needed for carrying out each activity along with the time of their need and taking into account the requirements when the project activities are at its peak. To work out the schedules for the all the project activities. To estimate the budget needed for carrying out each activity. To work out the organization needed for the project execution taking into account the requirements when the project activities are at its peak. Identification of known risks during project execution and to find the measures required to counter these risks. To identify the quality control procedures and resources needed during the project execution. To define the activities which need monitoring along with the parameters needed for monitoring. To define the controlling activities during the project execution along with identification of the control procedures needed. One approach which is often followed for project planning is to plan the outline first and then the plans are worked out in more details as the time to carry out an activity approaches. There are several tools which are available to assist the planning process for the project. These tools include (i) project planning checklists, (ii) project work plans, (iii) work break down structure, (iv) bar (Gantt) charts and PERT (program evaluation and review technique) charts, (v) logical framework analyses, and (vi) budgets etc. Project plans to be practical, it is necessary that the planning takes into account the Aainfrastructure and the other resources which are available for the project execution. During the project planning, the applicable standards and procedures which are required to be used during the project execution are taken into account. Since the project plans need continual updation, it is necessary that the change control mechanism is followed for the project plans. This helps to ensure that only current plans are used by the project team during the project execution. Critical activities are to be planned in greater detail in project plans so as to cover all the aspects of the critical activities. This helps in focused attention for the critical activities. Also for the critical activities of the project, alternative action plans are to be available as part of the project plans in case there are problems to implement the original plan. Normally project planning and project monitoring complement each other during the implementation of a steel project. To achieve it, it is essential that project planning identifies all the parameters which need to be monitored along with the target completions with respect to time as the project execution progresses. These checkpoint parameters are frequently called milestones. Finally it is necessary to communicate the project plan to all those who need to use it during the project execution.